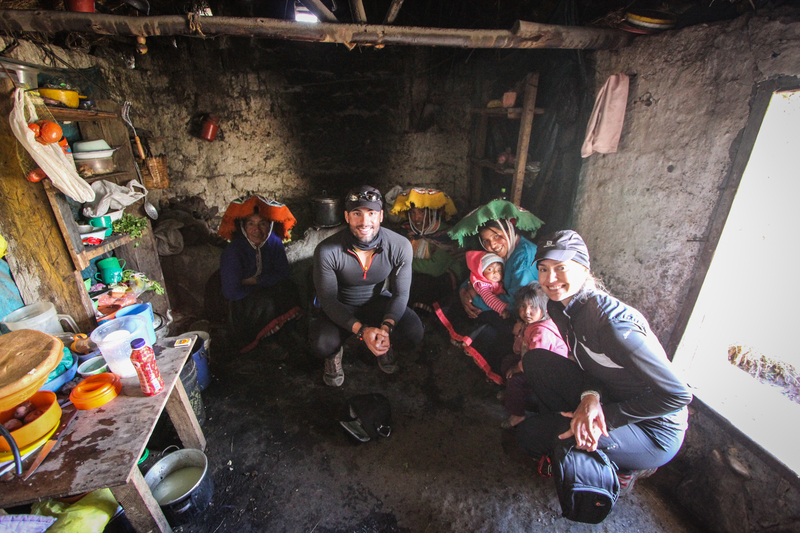 After completing the Salkantay Trek, Julia and I made our way back to Cusco and enjoyed a rest day in the rain. We spent a lot of time perusing the local markets and eating a lot of the local cuisine. We also made sure to keep our minds in trekking mode, as our second trek would be starting in less than 24 hours. Our initial plan was to only do the Salkantay Trek to Machu Picchu, but it seemed like a crime to fly down to Peru without doing any more exploring. I did a ton of research online before scheduling everything, and found the Ausangate trek to be the perfect fit. Much like our first trek, we met at the Alpaca Expeditions office the night before we left to hear of our itinerary. We also met our guide, Jose, a guide Julia and I would both grow to love in the days ahead. Unlike the Salktantay trek, which had six in the group, Julia and I would be the only people coming along for this one. We were very excited about that. Jose and a driver picked us up from our hotel early on day one of our trek to drive us from Cusco to the small village of Tinqui. The drive was about 3 hours long, and most of it was in the dark. I kept myself occupied reading Ken Follett’s World Without End while Julia slept. We arrived at a small market and stopped out front. The town of Tinque looked to have only a few hundred inhabitants, the buildings were of adobe construction with partially paved roads. The people were beautiful, with sun kissed skin weathered like golden raisins, and adorned with bright home woven alpaca garments. We arrived in the morning bustle at about 7 am, when people were buying food and goods for the day ahead. Our guide Jose, jumped out and disappeared into one of the markets while we waiting in the car. When he opened the door to leave, I could feel the bite of the cold and crisp alpine air. Jose arrived with a large transparent plastic bag full of leaves. He told us they were coca leaves and a gift for the people we would come across on our journey. It was a gift from Pachamama, who the Quechuan people believe to be the goddess that birthed earth and time. One thing I instantly appreciated about Jose, was his connection to the real Andean and Quechuan way of life. In Cusco, we learned about the Spanish conquest and the way they tried to stamp out any of the local beliefs. It was very cool to see how some of the people living far from city centers, with the protection of Pachamama high in the Andes, held closely to their language and belief system. For the first time, I felt like I was seeing the real Peru. The glorious and beautiful Peru. Along with his bag of coca leaves, Jose had also picked up a porter who would also be our chef, who was wearing a Manchester United warmup sweatshirt. His bowl haircut and chiseled, burnished features told me he was a local. I was wearing my down jacket, alpaca hat, and had the warmth of our van, but was still feeling the bite of the crisp mountain air. He was wearing jeans, his sweatshirt, no gloves, and no hat, and I envied him. Jose told us that the new man we had just picked up lived with his family in a small village that sits alongside the Ausangate Trek. We were also told the porter had a brother and a cousin that would be joining us later in the day. We arrived at a parking lot in the village of Quinsapucyu that was effectively the trailhead, and sat down on some foldout chairs for a quick breakfast. There was a pig rooting around closeby, next to a series of open cinder block hovels that were used as toilets. There was a beautiful creek that ran close by, with a wooden bridge guiding the way for our soon to come journey. We got to walking shortly after breakfast and passed through a series of homes that were built alongside the dirt road. Jose was taking handfuls of coca leaves, and giving them to the residents sitting outside. I didn’t understand the Quechuan they were speaking, but I could tell they were very thankful. One of the most notable was an older lady sitting in the shade with her back to an adobe wall. We were told by Jose after their conversation, that she saw good things in our future. Jose grew up in a small village and lived with his grandmother. He told us how they raised guinea pigs for food, and how the guinea pigs would run around the dirt floor of their one rooms house. Jose went to school in Cusco for tourism, started as a porter, and worked his way up to a guide. His English was impeccable, but more importantly, his ability to tell stories and bring the landscape to life is what I appreciated most. In just the first few hours, he taught us the Quechuan words for quite a few of the animals in the area, told us about construction methods used for local building construction, the religious beliefs of the locals, and much more. He also gave us some chocolate treats to hand out to the children we saw along the road. The kids were a little apprehensive at first, but they loved it and were very thankful. Our campsite destination for day one of the Ausangate trek was Upis Huarmisaya, which sits at the base of Ausangate, the highest mountain in the Cusco area. For the entire walk along the dirtroad, we had the peak of Ausangate right in front of us, with adobe houses, alpacas, and beautiful people surrounding us. A few miles into our walk on day one, we stopped at a small village comprised of three one room adobe buildings with straw roofs. One was the house of our porter and chef. It was here that we ate lunch, and had the chance to meet his family. After lunch, the views on day one were nothing short of spectacular, with golden hills stretching to the horizon and alpacas sweeping the tops of every hillside. We stepped off of the dirt road, and begin walking on a series of single track grazing trails. The summit of Ausangate became shielded in a voluminous veil of clouds, and the temperatures started to drop. It was only at that moment that I realized how warm the day had actually been. Living at high altitude can bring large swings in temperature. The sun giveth, and the sun taketh away. We arrived to our campsite and were surprised to find a solitary stone structure sitting outside of a natural hot spring. Every part of me wanted to jump in, but with the air being so cold, I just couldn’t make it happen. Instead, I explored the source of the hot spring a little, and waited for dinner. Our campsite at Upis provided incredible views of the snow capped Ausangate range, which began to clear as the temperatures fell along with the departing sun. For dinner, we had an incredible meal with soup, rice, chicken, and potatoes. We also got our first taste of the local Quechuan radio station. It played a vibrant, chirpy brand of music that consisted of about five songs that seemed to play on a loop. It was like the soundtrack I remembered from an Alvin and the Chipmunks movie I watched as a kid. It set a very playful and authentic tone for the days ahead. One of the most interesting things Jose told us about during our conversation at dinner was the story of the Quyllur Rit’i festival. This festival is held in a close by valley, and features dancing, food, and a lot of traditional aspects of Andean culture. I hope to make it back someday to experience this. Mate! you did one trek than started another? You be crazy! lol. But that is awesome. Lucky your partner enjoys it too huh? I loved your photos and te story. You write so well. Inspires me to write up my inca trail experience when i get a chance. Cheers! haha, we wanted to make the most out of our two weeks in Peru! It’s been really nice for us to relive the experience as I’ve been doing these write ups! You should do the same with your Inca trail adventure! Cheers! Quite inspiring. You should have taken the plunge into the warm spring huh? Anyways, Love the story and the way you create vivid pictures with words..
makes me wanna fast forward to July..
What would you say are the warmer months to go to this area? My mother in-law has been saying she wants to go to Peru to see the Ausangate Mountain but she is a freeze baby! My husband (her son) and I got married young, I am only 24 myself, and she wants the three of us and her friend to go in the fall. I am thinking that would be a cold time to go, would it not? I really enjoyed reading this. I will have to share it with her. I have done the Salkantay trek with Macchu Picchu and Huayna Picchu the following day. How did Ausangate compare to Salkantay Trek? For pure beauty and solitude, Ausangate blows it away. Machu Picchu was great, but the beauty and views of Ausangate are on another level.